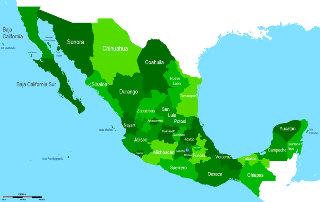 Divisions: The country of Mexico is divided up into 31 states and one Federal District. The Federal District includes the capital city of Mexico City. The largest states by population are Mexico, the Federal District (Mexico City), Veracruz, and Jalisco. The largest by area are Chihuahua, Sonora, Coahuila, and Durango. Coat of arms - A golden eagle holding a snake while perched on a prickly pear cactus. Description of flag: The flag of Mexico was adopted on September 16, 1968. It consists of three vertical stripes of green (left or hoist side), white (middle), and red (right). The Mexican coat of arms is at the center of the flag. The color green stands for hope and prosperity, white for peace and harmony, and red for the blood of Mexican heroes. 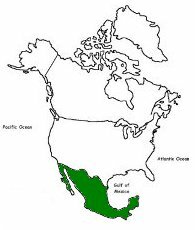 Origin of the name Mexico: The name "Mexico" comes from a Nahuatl word describing the land where the Aztecs lived. 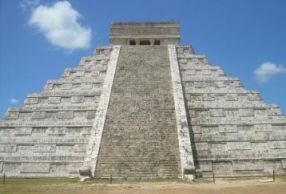 It was on the site of the Aztec city Tenochtitlan that Mexico City was built by the Spanish.